As a tree grows, its roots dig deeper and deeper into the ground, planting the tree firmly into the earth so that it does not wither or fall. Likewise, a person who is rooted in God will remain steadfast. What does it mean to be rooted in God? If we take a lesson from the tree, it means being planted, securely attached, and digging in deep. When we "dig in deep" to God, we are securing ourselves to Him, preparing ourselves so that in hard times, we don't waver, fall, or wither away. But how do we practically apply this? When a tree is growing at it's highest potential, it is getting watered and fed amply. It is grabbing water and nutrients from the ground that it is rooted in, causing it to become bigger, stronger, and more secure. As Christians, we are the same way. We need to be watered and fed often in order to sustain our health. In a relationship with God, our sustenance comes through four main parts: scripture, prayer, church, and godly friends. Scripture is probably the biggest piece of the puzzle (though you need all the pieces). Scripture is God's written word to us. We have a hard-copy of what He has said right in front of us. What He has said is not always easy, but what He has said is always helpful, useful, and for our good. The more we open His word and flip through the pages, the more our Spirits will be fed. Our nourishment comes in the form of knowing God more, learning His desires, and conforming our ways to His. But we cannot do any of those things if we never learn what He has said to us. Prayer is basically us talking to God. And prayer is a lot more for us than it is for Him. God already knows our hearts, our desires, our beliefs, and our thoughts. God knows what we will say before we say it. But God also knows that we are relational beings. If we didn't have a way to come to God in a more conversational way, we probably wouldn't come at all. God calls us to pray constantly about all things: our thanksgiving to Him, our excitement, our sadness, our anger, and our fears. We don't come to change God's mind about anything, or to make Him love us more. We come to God to give our hearts to Him, to lay down ourselves and our lives, and to realize that He is a personal God who hears us. Church is actually a controversial topic. Many Christians have been so hurt by the church that they have no desire to go back again. Other's believe that churches should gather in people's homes. Others wrongly equate church-going with salvation. But going to church doesn't save you. If I never went to church again, I would still be saved. However, I would also be disobeying God. I would be going against His desire for me to gather with a body of believers, under sound teaching, and uniting with my brothers and sisters in Christ to minister to those who don't know Christ. The disciples and the early church fathers believed in the importance of gathering together for worship. If it was important to those who actually walked with Christ on earth, shouldn't it be important to us too? Being rooted in God also requires surrounding ourselves with godly friends and influences. It is incredibly difficult, maybe even impossible, to remain steadfast in something if we are never being encouraged towards it. If we are not around other Christians, the world will eat at us. It will chip away at our roots, and will make it a whole lot easier for us to sway back and forth. We need people in our lives who can encourage us in the ways of God. It's not that we can only be around Christians. We don't have to find a job where only other Christians work...but we do need a support group in our lives. We need people who will encourage us in the right, and call us out on our wrong doing, thinking, and beliefs. Remaining rooted is a lot of work. But it is the work of God in us. We cannot do it on our own, but reading scripture, praying, going to church, and staying connected to godly support is our part. If we were to unplug a laptop, it would no longer be connected to the source; it would then be running on battery power. It may be able to run for a short time on it's battery life, but after a while, it would stop working. As Christians, we are the same way. 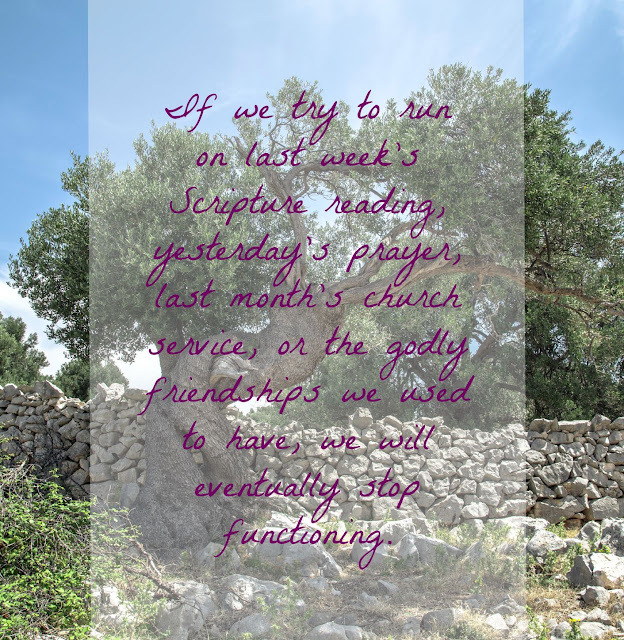 If we try to run on last week's Scripture reading, yesterday's prayer, last month's church service, or the godly friendships we used to have, we will eventually stop functioning. We'll stop "working", because we are no longer connected to the source, or rooted to the nutrients. In order to stay rooted in God, we cannot run off of nutrients and resources that have already been used up. We need to be refreshed by God as often as possible, so that we can remain grounded in Him for all the days of our lives. You bring up all great points that are necessary for staying rooted in Christ. Friendships is hard for me, especially finding other married (and mature) couple friends. Hoping for new, genuine friendships soon! Summer, I am sorry you struggle in that area. I hope that you find those friends. They are such an important part of the Christian life. I know it's hard, but keep putting yourself out there- at church, at work, at the grocery store....everywhere! haha. You stated it perfectly - we cannot do it on our own! 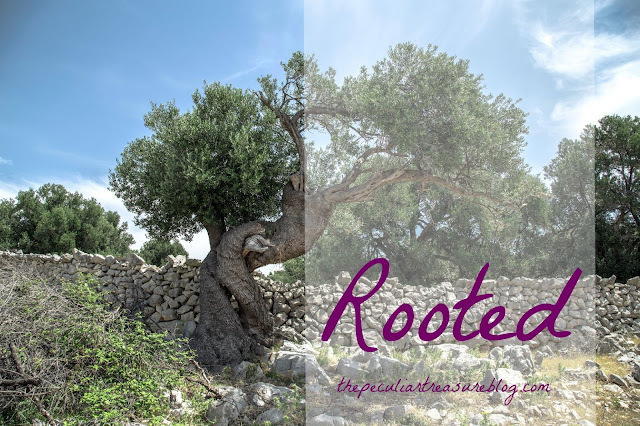 I love the comparison of our relationship with God to a deeply rooted tree - lovely post! Thank you, so much, Erin! This has been my struggle lately but I always have to remember to come back to God! It's so tough sometimes! I completely understand! Love these points! I have family members who can't make it to church for various reasons but they still take the time to meet with other believers for fellowship during other times of the week. Yes, my nana is physically unable to attend church right now, but she still watches sermons on tv and stuff. I understand that. Beautiful! One of my favorite verses is the psalm where they talk about how a tree that grows by the stream (with it's roots growing deep and close to the source of life) grows strong and tall, even as other trees wither. I love this encouragement and reminder to take steps to make our roots grow deep! I love that verse too <3 Thanks, Lauren!